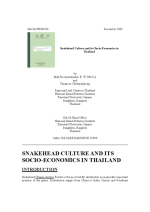 This publication describes the culture practices and socio-economic aspects of snakehead farming in Thailand circa 1985. It covers snakehead biology, culture systems, site selection, stocking and rearing, feeding and health aspects. The paper also describes economic profile of snakehead farmers, seed procurement, feed costs and feeding issues, fixed, variable and opportunitic costs of production. It also investigates the relationship between farmer experience, farm size, and profitability of snakehead farming. 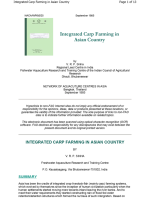 Ths paper enumerates different carp integrated farming systems being prevalent in Asia along with successful case studies indicating potential and constraints of such systems. It recommends to integrate carp farming with agriculture and irrigation, livestock farming, sewage utilisation and water pollution control not only to increase the productivity of land and water and improve the economic conditions of poor farmers but also to maintain health and hygiene of the rural poor and city dwellers alike. The farming of the giant freshwater prawn has expanded rapidly in Thailand. Production has increased from less than 3 tons/year in 1976 to an estimated output of more than 1,200 tons in 1982. This rapid growth was largely stimulated by the Chachoengsao Fisheries Station established solely to promote culture of the prawn. Services of the station comprise the production and free distribution of post-larvae from 1976-1978, along with training and extension programmes. 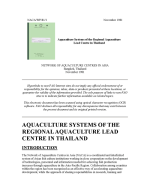 This document briefly describes the status of the aquaculture in the Regional Aquaculture Lead Centre for Thailand circa 1981, in terms of available species and research priorities. Work was conducted on air-breathing catfish Clarias batrachus, snakehead Channa striatus, giant freshwater prawn Macrobrachium rosenbergii, silver barb Puntius gonionotus, snakeskin gourami Trichogaster pectoralis, mussels Perna viridis and oysters Crassostrea spp. 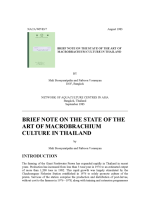 Includes brief descriptions of culture methods prevalent for these species at the time.